You have probably seen capers on the shelf in your local grocery or gourmet store, and you may be asking the question, "What is a caper"? 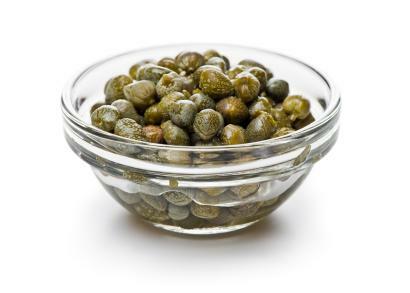 The capers used in gourmet dishes are actually the pickled bud of the caper plant, which is native to the Mediterranean region and some parts of Asia. The caper plant is a perennial bush and it produces fleshy, round leaves and white flowers. It is a relative of the cabbage, but looks more similar to a rose bush. Caper plants usually grow wild and can be found climbing up walls or in rocky coastal areas. Caper buds are picked by hand, which is the main reason for their high cost. They are often sold salted and pickled. The mature fruit of the caper plant is processed in the same way and is marketed as a caper "berry." When the buds become a shade of dark olive green and are the size of a kernel of corn, they are ready to be harvested. Once picked, they are pickled in salt, wine, or in a solution of vinegar and salt. Mustard oil is released from the caper bud upon being cured, which results in the intense flavor commonly associated with the caper. The release of mustard oil also leads to the formation of a substance known as rutin, which causes the formation of crystallized white spots on the surface of many of the caper buds. Capers are commonly used as a garnish and are especially popular in Italian cuisine. They are particularly admired in Sicily and Southern Italy. Capers are most often found in salads, pasta salads, pizza, meat dishes, and pasta sauces. Capers are also one of the ingredients present in tartar sauce, which is often served with salmon and other fish dishes. Unripe nasturtium seeds can be pickled and used as a substitution for capers, as their flavor and texture is very similar to the caper berry. Capers were first mentioned in writing over 3000 years ago as an ingredient in the book Gilgamesh, which may be the oldest written story in the world. The caper was used by ancients Greeks to prevent flatulence. In biblical times, the caper berry was thought to be an aphrodisiac, and is mentioned in the Bible in the book of Ecclesiastes. Capers add a very unique flavor and texture to any dish. The next time someone asks you, "What is a caper?" you can whip them up a tasty recipe with a caper garnish.